The charger is not 100% efficient. The Tesla converts the AC line input to DC to charge the batteries. This can be as high as 92% efficient, but varies depending on a number of conditions. On average, it is probably closer to 80% efficient through the entire charging process. The Model S uses energy even when it is not driving. With recent software versions (5.8) there is an energy saver mode that significantly reduce this, but can add time the car "starting" (bringing up all the computers and devices shut down to save energy). The chart below shows the total meter-to-miles effiency accounting for these losses. As you can see, if you don't drive much, the efficiency goes down since the non-driving losses aren't amortized over a large number of miles driven. 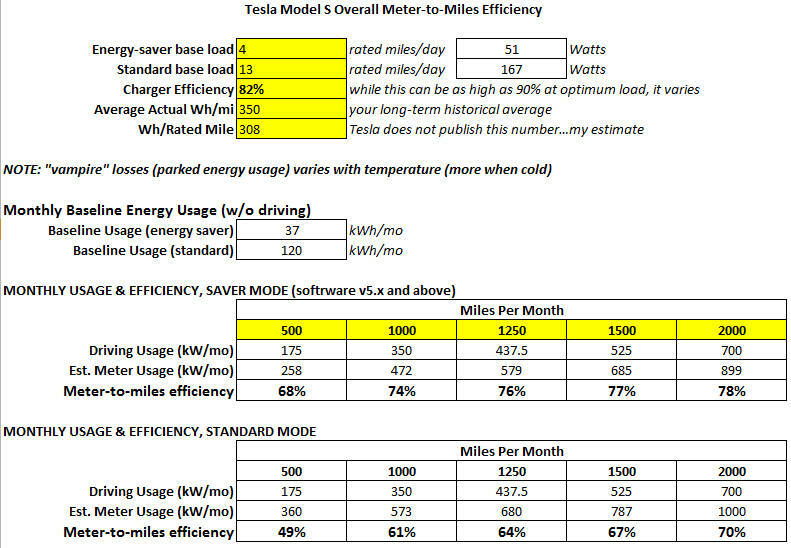 You can download the Excel file and put in your own assumptions for your Wh/mi driving, charger efficiency, etc.